On March 12, the day before the banks were set to reopen, Roosevelt held his first “fireside chat” ([link]). In this initial radio address to the American people, he explained what the bank examiners had been doing over the previous week. He assured people that any bank open the next day had the federal government’s stamp of approval. The combination of his reassuring manner and the promise that the government was addressing the problems worked wonders in changing the popular mindset. Just as the culture of panic had contributed to the country’s downward spiral after the crash, so did this confidence-inducing move help to build it back up. Consumer confidence returned, and within weeks, close to 2,500. Other measures designed to boost confidence in the overall economy beyond the banking system included passage of the Economy Act, which fulfilled Roosevelt’s campaign pledge to reduce government spending by reducing salaries, including his own and those of the Congress. He also signed into law the Securities Act, which required full disclosure to the federal government from all corporations and investment banks that wanted to market stocks and bonds. Roosevelt also sought new revenue through the Beer Tax. As the Twenty-First Amendment, which would repeal the Eighteenth Amendment establishing Prohibition, moved towards ratification, this law authorized the manufacture of 3.2 percent beer and levied a tax on it. Even as he worked to rebuild the economy, Roosevelt recognized that the unemployed millions required jobs more quickly than the economy could provide. In a push to create new jobs, Roosevelt signed the Wagner-Peyser Act, creating the United States Employment Service, which promised states matching funds if they created local employment opportunities. He also authorized 4.5 million through relief payments. But the larger part of the program paid southern farmers to reduce their production: Wheat, cotton, corn, hogs, tobacco, rice, and milk farmers were all eligible. Passed into law on May 12, 1933, it was designed to boost prices to a level that would alleviate rural poverty and restore profitability to American agriculture. These price increases would be achieved by encouraging farmers to limit production in order to increase demand while receiving cash payments in return. Corn producers would receive thirty cents per bushel for corn they did not grow. Hog farmers would get five dollars per head for hogs not raised. The program would be financed by a tax on processing plants, passed on to consumers in the form of higher prices. Another problem plaguing this relief effort was the disparity between large commercial farms, which received the largest payments and set the quotas, and the small family farms that felt no relief. Large farms often cut production by laying off sharecroppers or evicting tenant farmers, making the program even worse for them than for small farm owners. Their frustration led to the creation of the Southern Tenant Farmers Union (STFU), an interracial organization that sought to gain government relief for these most disenfranchised of farmers. 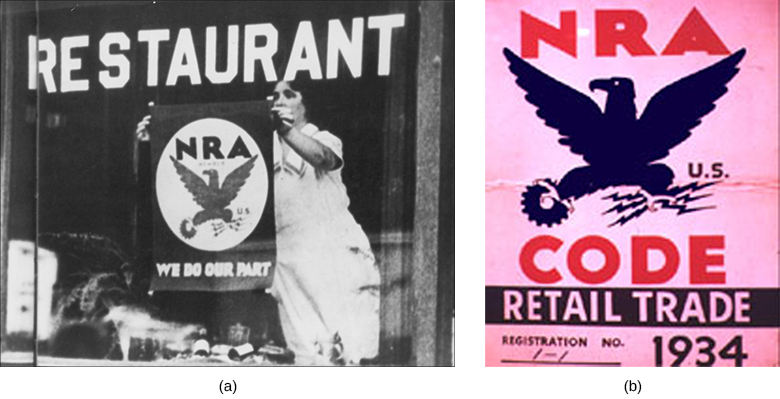 The STFU organized, protested, and won its members some wage increases through the mid-1930s, but the overall plight of these workers remained dismal. 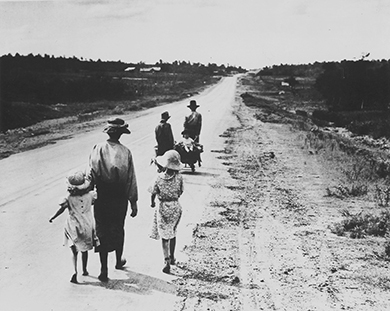 As a result, many of them followed the thousands of Dust Bowl refugees to California ([link]). The NIRA also created the Public Works Administration (PWA). The PWA set aside 3 billion to states to operate direct relief programs from 1933 to 1935, as well as undertook several employment projects. The First New Deal by OpenStaxCollege is licensed under a Creative Commons Attribution 4.0 International License, except where otherwise noted.